January has kicked off with a bang, and the much anticipated super-mega-Godzilla El Nino is upon us. El Niño conditions have been in place for months (Figure 1: Oceanic Niño Index), but has this El Niño event been impacting the weather of the Southwest in ways that are expected? Sort of, but not exactly. This is probably to be expected, as we and others have been saying, no two El Niño events are alike (which means they are hard to compare), AND the October-November-December time period is still very early season for El Niño in the Southwest, so it would be premature to judge it too harshly, or to call this as having gone off the rails. First off, the October through December time frame is a period of transition for the Southwest where we move from our summer monsoon thunderstorm season into a more westerly upper level circulation pattern and look expectantly for winter storms to bring precipitation to the region. October is also the time where a tropical storm can either directly or indirectly bring a boatload of moisture that can bring heavy precipitation to the region. Even during a ‘normal’ year with no El Niño influence, it is a ‘noisy’ time with lots of moving parts and potential variability, with quite a few dry and wet extremes in the historical record. Long story short, El Niño or not, we expect to see a lot of variability during this transition season, so the larger question is how much does El Niño typically impact this season? 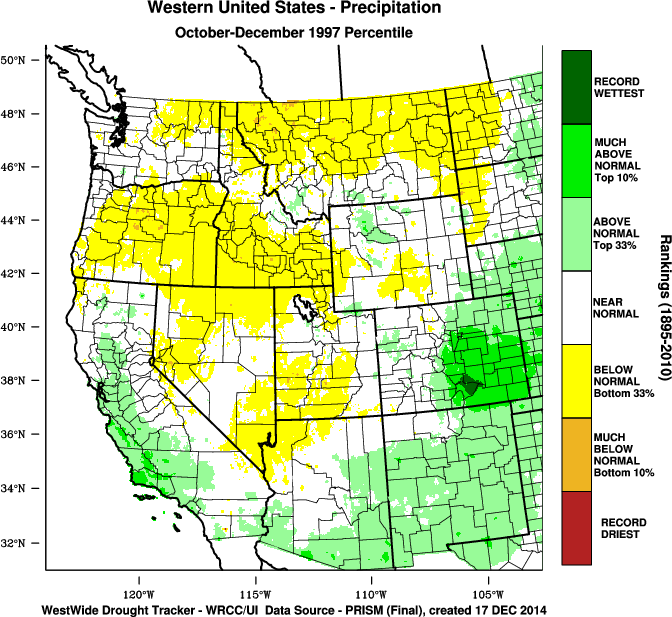 The influence of El Nino during this Oct-Dec transition operates through the mechanisms of tropical storm activity and early winter storm tracks, both of which can impact precipitation patterns across the Southwest. Typically, tropical storm activity is enhanced in the east Pacific during strong El Niño events, raising the likelihood of above-average precipitation from these events. And the southward shift in the winter storm track, which is a hallmark impact of El Niño events, can set up as early as November. 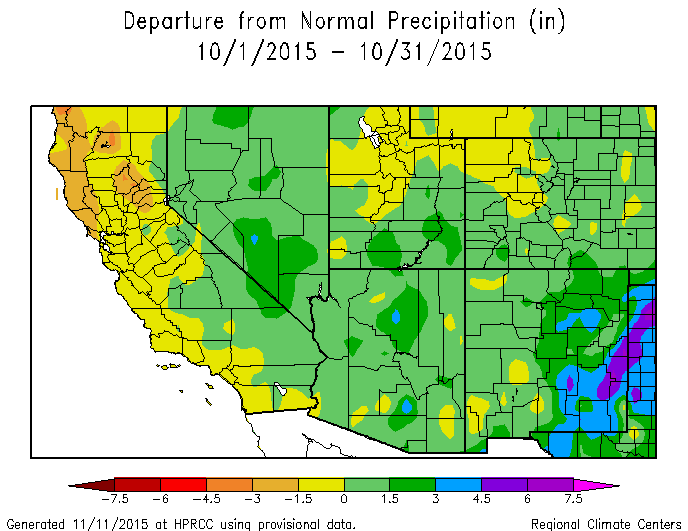 Based on this, we did largely expect this period to be wetter than average for Arizona and New Mexico and it mostly was (Figure 2: Departure from Normal Precip Oct-Dec 2015). But when we look a bit more closely, how we got this precipitation was a bit unusual, and it really didn’t fit the typical El Niño driven patterns. 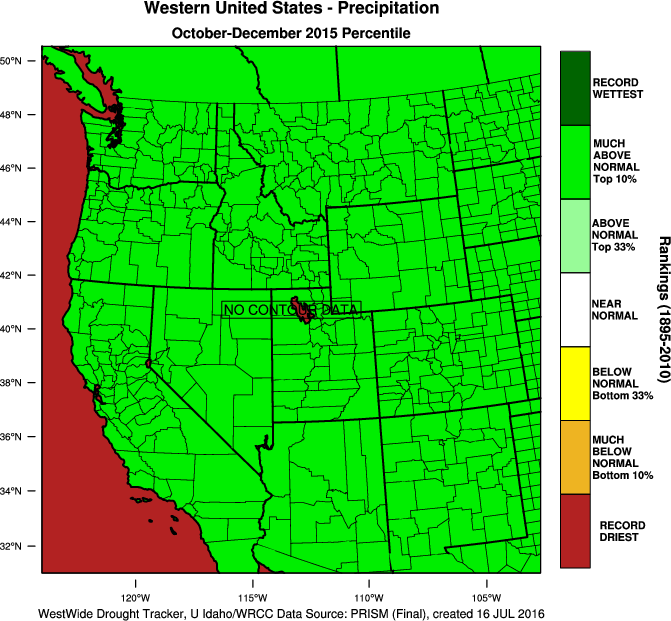 For example, in October a series of cut off low pressure systems wandered across the Southwest (at one point, the same cut off low visited Arizona twice) picking up abundant tropical moisture to the south and creating widespread precipitation events across Arizona and New Mexico. These cut-off lows formed off a very busy jet stream pattern across the Pacific Ocean that in part was energized by all of the tropical storm activity across the basin (see the NOAA discussion here). Instead of directly interacting with tropical storms in the east Pacific, El Niño appears to have brought us to above-average precipitation for October in a much more complicated way (Figure 3: Departure from Normal Precip Oct 2015). A highly amplified jet stream pattern continued into November, again partially driven by tropical storm activity being absorbed into the jet stream in the west Pacific (see NOAA synoptic discussion), leaving the Southwest to contend with a busy weather pattern but very little to work with in the way of moisture. A parade of storms marched through the Southwest through the month, but originated in the Gulf of Alaska and brought very little moisture with them. 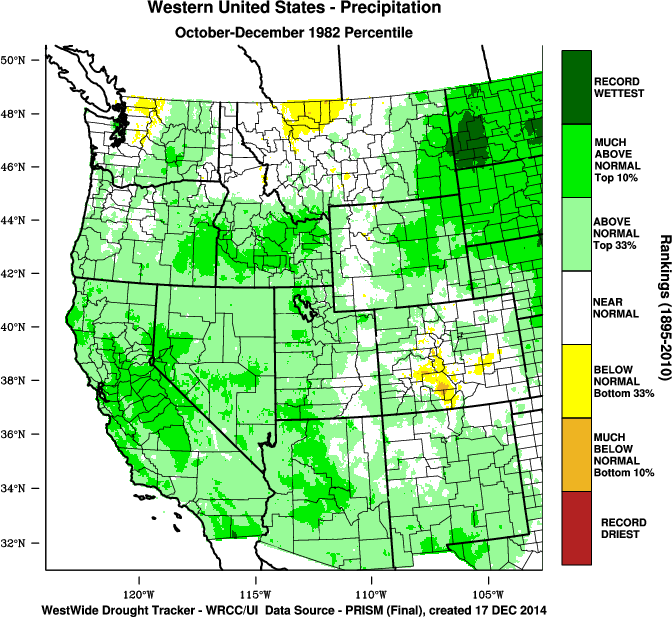 Some higher elevation and more northern areas were able to squeak out some precipitation with these storm systems, but overall the month was cool and relatively dry for the Southwest (Figure 4: Departure from Normal Precipitation Nov 2015). This was in contrast to the expectation of a much stronger subtropical jet (which was present, but south of AZ and NM) pulling in abundant moisture from lower latitudes. 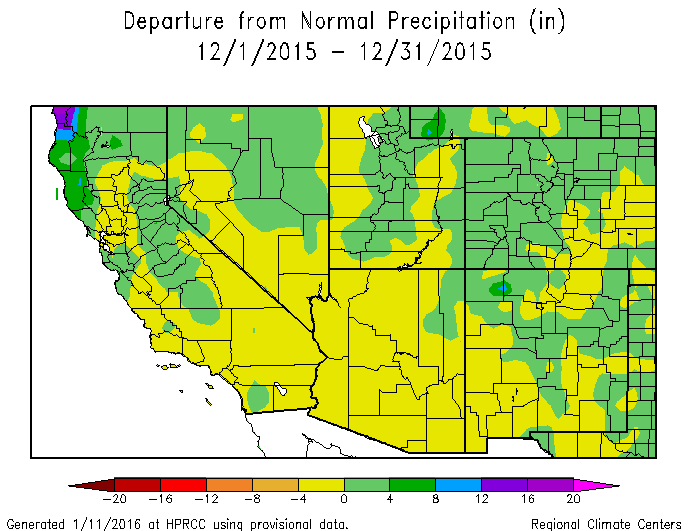 December was largely characterized the by same pattern with the Southwest seeing passing storms and cooler than average temperatures, but little in the way of precipitation (Figure 5: Departure from Normal Precipitation Dec 2015). New Mexico was able to buck this trend a bit late in the month as a historic blizzard (compared to a similar snowstorm that hit the region in January of 1983, also a strong El Niño winter) swept through the area. 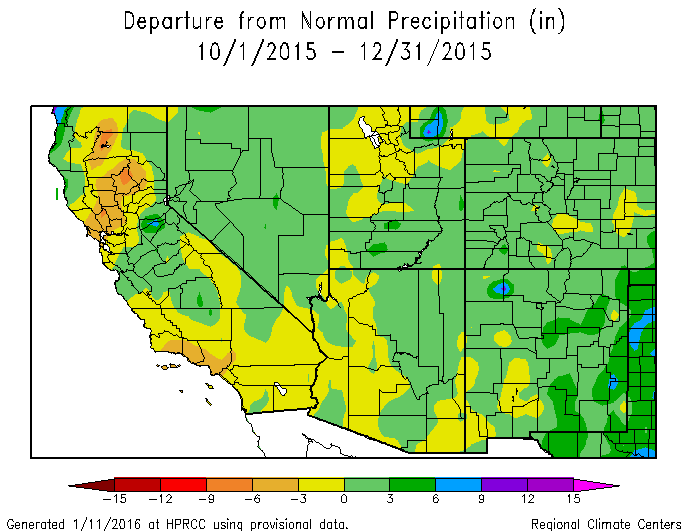 The final precipitation totals for Oct-Dec 2015 across the Southwest are more or less what you would expect (generally above-average precipitation across New Mexico and northern AZ) for an El Niño year and a bit of the unexpected (drier-than average conditions across parts of western Arizona). But again, maybe that is what we should expect. Two other strong El Niño events (1983, 1997) are depicted for the same time period and are very different from each other. 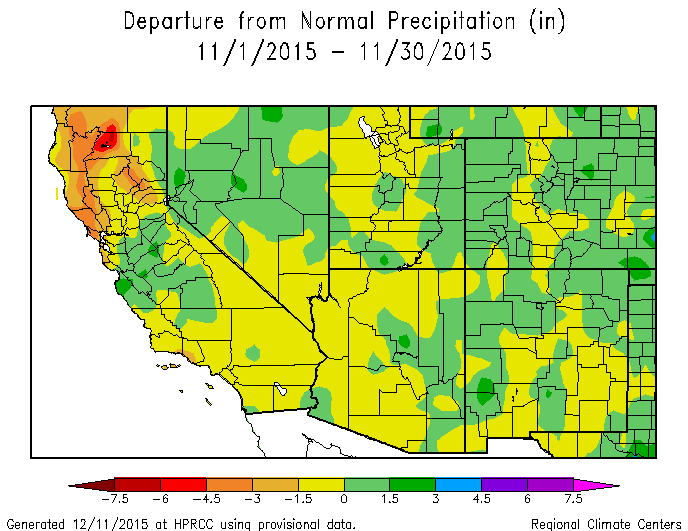 Oct-Dec 2015 establishes itself as yet another flavor of potential precipitation impacts during the fall season across the Southwest U.S.